Thanks to Jim Walsh, whose kind assistance and contribution helped to bring this information to you. I have in my possession a bible for some 50 years. I found it in a book store in the used book section some 40 to 45 years ago in Nassau County, New York. I have kept it all these years because I felt that some day I would find a relative who would love to have the book. 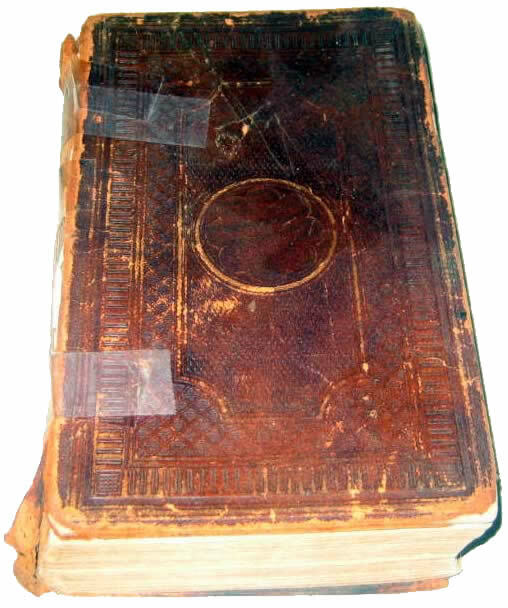 It is a family bible that dates back to 1874. 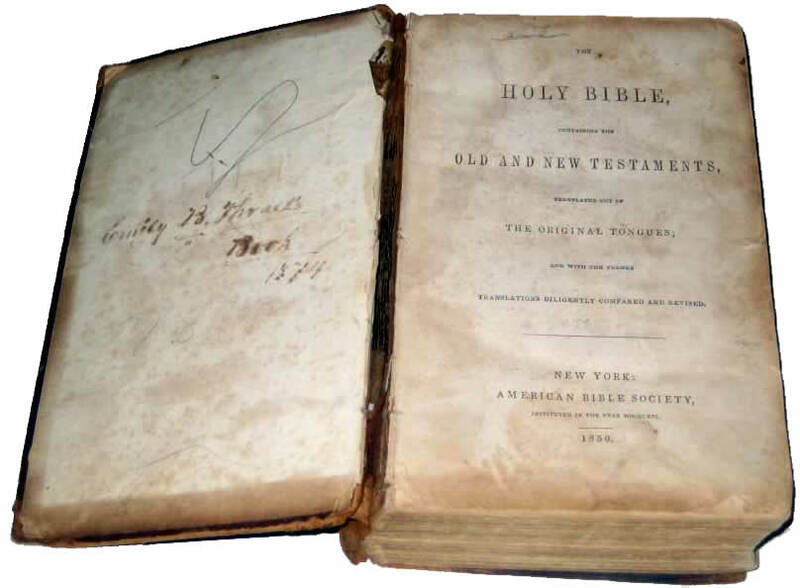 The bible belonged to one: Emily B Thrall 1874. 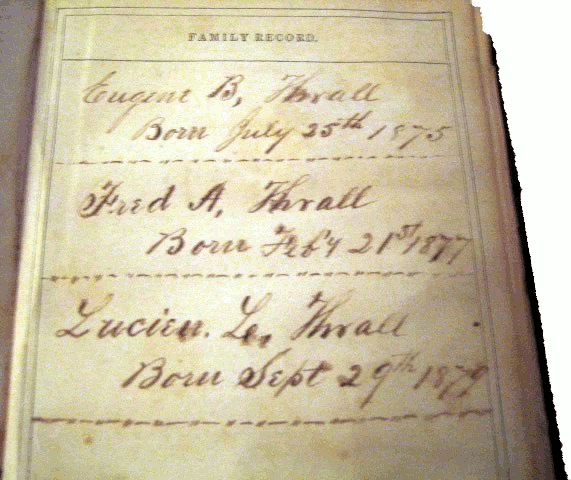 In the book she list three births: Eugene B Thrall, July 25th 1875, Fred A Thrall Feb 21. 1877 and Lucien L Thrall Sept 29th, 1879. The book was her Bible with the old and new testament. I have had this bible in my possession for more years then I can remember (I'm 76), and one of the reasons I held on to it is, that somewhere in the back of my mind, I knew that some day I would find a way to seek out the children or grandchildren of the person the bible belonged to. I just felt that they would be finding a lost treasure. And so, that day in my mind has arrived. I spent a lot of time searching the net until I found your site. For me, it will be the end of a long quest to find a proper place for the book. And I'm sure you will enjoy receiving it. Before receiving this information, Thrale.com only knew the birth years for the three children mentioned above, and had no dates about Emily. Thrale.com has used this information to update the stated dates. 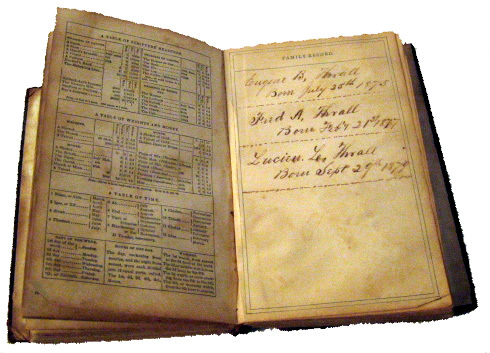 We also believe that the entries were written sometime between 1879 and 1789 (when a fourth unnamed child Fannie C. Thrall, was born) and have since used this information to update the published family tree. 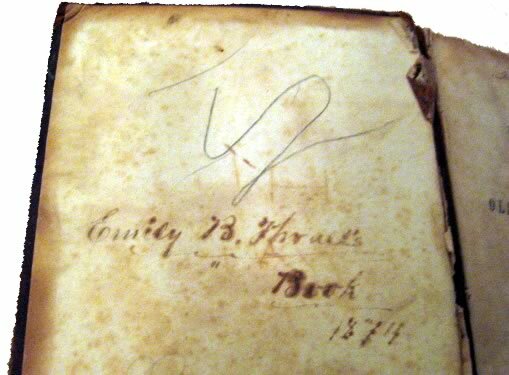 Unfortunately we have no information about the descendants of Emily's four children - three of whom are named in the family bible. If you have any information about other descendants, do please let us know. Family tree for Emily Thrall.